On the official website of the Hotel Boston in Milan, you can book the rooms quickly and get the best price. The system ensures that your bookings will be confirmed by E-mail and no money will be debited from your credit card when you book the room online. The Hotel Boston is located in the commercial and historical centre of Milan. It offers many types of rooms from single rooms to triple rooms. All the rooms are en-suite with modern bathrooms and the location is quiet and easy to be reached. 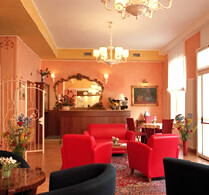 Hotel Boston is located in a very quiet neighbourhood of Milan city centre area, where all guests can rest comfortably. All the rooms are well designed with modern accommodations. Wi-Fi can be connected to throughout the whole hotel and used freely by the guests. We offer the cheapest price in the city centre of Milan compared to other hotels of the same category as well as professional service. 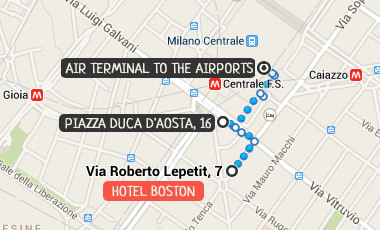 The Hotel Boston is next to the Milan's Central Station. The convenient location not only opens up Milan's public transport system to the guests, it also means you are well connected to the surrounding areas. The Hotel Boston has a fully licensed bar and a renovated breakfast hall. It provides you a self-service breakfast in the morning and delicious coffee for you anytime. Located on the Road Via Roberto Lepetit, you can see from a map we are exactly located in Milan's historical centre. Just a 4 minute walk from the Central Station and 2 minutes from the nearest subway station, you can find our hotel and easily access to the entire city as well as Milan's surrounding areas. From the Central Station you can quickly and cheaply get to both of Milan's major Exhibition Centres, Fiera-Fiera Milano Rho and Fiera Milano City. We are located just 3 minutes from the shuttle bus station where you can take the bus to the Linate, Malpensa and Bergamo Airports.